Yes you read it right. Get 50% cashback on your postpaid phone bills. We all have used cashback codes and discount coupons to get amazing offers while shopping online, but Today I will share with you'll a simple trick on how you can get 50% Cashback on your Postpaid phone bills. Yes it is the Get5 coupon code. If you read the fine print it says "User can use this code 10 times every day." Which for me translates to RS 50 cash back for every Rs 100 Spent in a day. So how do we get 50% cash back on our post paid bills which are like around Rs500 etc. Let me show youl step by step how to get your 50% cashback on your phone bills. To get the cashback all you need is just 10 to 15 mins of your time daily. Firstly devide your bill by 10. So if your bill is Rs500 then all you do is 500 divide by 10 which is 50. Now thats the number of transactions you need to do of Rs 10 each to get Rs 5 cashback on each, which totals upto Rs 250 cashback on a total bill of Rs 500. Sweet deal isn't it. Now the catch is you can only do 10 transactions a day. So divide your number of transaction by 10 i.e. in my example 50 transactions divided by 10 which makes it 5. So it takes me 5 Days to complete my full bill transaction and get Rs 250 cashback on a bill of Rs 500. 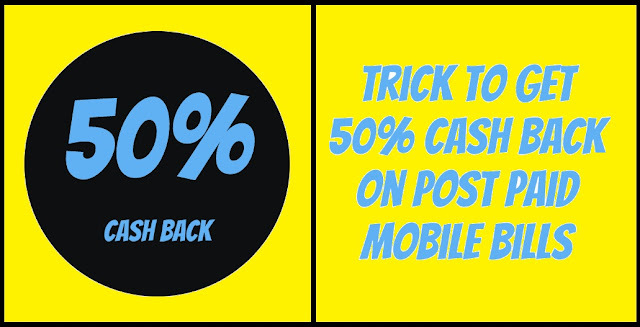 So now you know how to get 50% cashback on your postpaid phone bills, go ahead and try it out. Don't forget to share the post with your friends so they can benefit too. If youll do not have a paytm account register for the same from here.